Daijaku Kinst joined the faculty in 2010 and was named Noboru and Yaeko Hanyu Professor of Buddhist Chaplaincy in 2015. 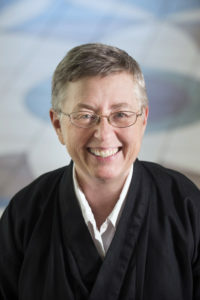 After completing formal training as a Soto Zen priest, Daijaku obtained a Master’s degree in psychology, licensure as a psychotherapist, and trained as a chaplain at UCSF Medical Center. She completed her PhD in 2004. Her study focused on the Buddhist teachings of dependent co-arising, emptiness and no-self as they relate to the experience of trust, faith and transformation in the practice of Soto Zen Buddhism. Along with her teaching at IBS, Daijaku is also guiding teacher, with Rev. Shinshu Roberts, of Ocean Gate Zen Center in Capitola California and has been appointed kokusaifukyoshi, International Teacher, by the Japanese Soto Shu (Soto Zen School) in Tokyo. She is active in the development of Soto Zen in North America through her involvement in Soto Zen organizations. Buddhist ministry meeting contemporary challenges: racism, sexism, addressing climate change etc. Trust Realization and the Self on Soto Zen Practice, Institute of Buddhist Studies/BDK America, 2015. “The Path by Moonlight: Dogen’s Guidelines for Following the Way.” In Seeds of Virtue, Seeds of Change: A Collection of Zen Teachings, Temple Ground Press, 2014. “Ziyong’s Ship of Compassion.” In The Hidden Lamp: Stories from Twenty-fince Centuries of Awakened Women, Wisdom Publications, 2013. “Cultivating and Appropriate Response: Educational Foundations for Buddhist Chaplains and Pastooal Care Providers.” In The Arts of Contemplative Care: Pioneering Voices in Buddhist Chaplaincy and Pastoral Work. Wisdom Publications, 2012.